The idea of experimental arts is evident in the branding of national bodies. The Australia Council for the Arts now has an Emerging and Experimental funding category, replacing its Inter-Arts Office. UNSW Art & Design (formerly the College of Fine Arts) incorporates the National Institute of Experimental Arts (NIEA). The Experimental Art Foundation has become the Australian Experimental Art Foundation (AEAF). Experimental arts have gone national, but what does experimental actually mean? 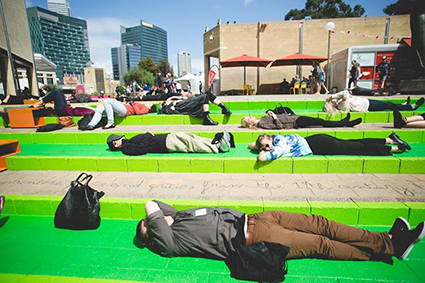 A series of discussions at the National Experimental Arts Forum (NEAF) in Perth sought clarity. They were shadowed by two conundrums: first, how best to articulate the value of experimental arts amid the recent threat to Australia Council funding; second, the relationship between experimental art and science. This second conundrum came from NEAF’s host, the art laboratory SymbioticA, which had just held an international conference on Neo-Life and organised several exhibitions foregrounding collaborations between artists and scientists. 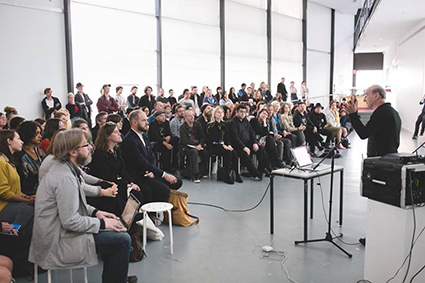 Amid the sessions, an ongoing debate between Vicki Sowry of the Australian Network for Art and Technology and SymbioticA’s Oron Catts and Ionat Zurr revolved around the autonomy of artists in collaborative situations. Zurr is concerned about the extent to which artists are being used to illustrate science and industry, the way that artists are employed for data visualisation and sonification projects. For her, a key difference between art and science is that art should be allowed to fail, rather than celebrate scientific success. The value of failure, of process and experimentation, found another advocate in Australia’s savant of experimental art, NIEA’s Paul Thomas. In Thomas’ session on education, dLux MediaArts director Tara Morelos suggested that experimental art “makes strange with the technology, to force it where it does not belong.” Thomas then asked the group to conceptually disentangle arts made with technology and media from experimental arts, in the process illuminating some of the slipperiness of these terms. Another angle on the problem came from Canadian academic Chris Salter, who in a concluding talk pointed out the similar histories of experimental art and experimental science. Both artists and scientists are expected to produce results of one kind or another that may or may not have anything to do with what actually takes place in their messy studios and laboratories. Salter, Thomas and Zurr all work in universities that define themselves by experimental research, and are in something of a protected situation when it comes to making art. Many of the attendees, however, spoke about being stuck in funding cycles that shift from project to project, requiring outcomes rather than open-ended processes. These discussions had a depressing edge as participants tried to articulate what they did in terms of more concrete social and institutional values. The recent threats to federal funding show how experimental artists need new and better arguments for their practices, and the conference rehearsed several of these. In an interactive keynote, performance outfit PVI asked whether art and politics should be distinct. Only Stelarc stood to agree with the proposition! His example may well stand as Australia’s best ontological argument for experimental art. A video of Stelarc in the DeMonstrable exhibition at the Lawrence Wilson Gallery, called PROPEL-Ear on Arm Performance (2015) shows his body being swung around on a robotic arm, jerked from position to position. This robot body has all of the profound qualities of the artist’s more famous works, its audaciousness making a simple, sensual argument for its own intrinsic brilliance. PVI suggested another reasoning for experimental art through a Frank Zappa video. 99% of NEAP attendees agreed with Zappa that “progress is not possible without deviation.” This is what Chris Salter calls a logic of innovation, as if artists will come up with new ideas and new knowledge purely by being different. This is something of a self-defeating argument, as instrumental inventions may or may not come out of an artist’s studio. Even more troubling was a session in which artists complained about their marginalisation from the Australian mainstream, but at the same time defining experimental art as that which is marginal! Surely, this logic will only keep experimental artists at the margin! Stronger arguments were made in other sessions. Darwin Community Art’s Christian Ramilo reminded everyone of the Universal Declaration of Human Rights that says everyone has a right to the “enjoyment of the arts.” For Ramilo, the recent threats to the autonomy of arts funding undermine this right. Sitting next to Ramilo, SymbioticA researcher Guy Ben-Ary described the speculative role of the artist who plays out the ethical implications of developments in the laboratory. As if to illuminate the point, Ben-Ary, on the night before NEAF, performed cellF, an improvised concert of cellular neurological networks jamming with a jazz drummer in Japan. Despite the weighted and urgent nature of many discussions at NEAF, delegates came together for many highlights, notably three brilliant keynotes that took nothing for granted: an action packed performance lecture (PVI), a whisper quiet anti-performance lecture (Cat Hope) and a journey through bodies augmented, cellular and virtual (Stelarc). So too in the many improvised discussions and fortuitous conversations, the serious atmosphere produced brutally honest and productive exchanges. Such is the vitality of what attendees were reluctantly calling a ‘sector,’ that like other sectors of Australian activity must learn to advocate for itself, to demonstrate its ontology in ways that everyone from the scientist to the voting public can understand. As the field of science communication has been so successful in articulating the intrinsic interest of science and its social value, so the experimental arts need to be better at communicating themselves. We need an experimental art communication that brings the concepts of its practitioners onto a more public stage. At NEAF in 2015, arguments and methodologies for experimental art were being tested among colleagues and friends. What remains is for these arguments and methodologies for experimental practice to make themselves more visible through punchy, quality art and its ideas.